I recently went to the Jigokudani monkey park in Nagano, famous for its lazy macaque monkeys. They have earned their lazy stripes relaxing in hot springs, passing the cold winter in their own little monkey heaven. It was amazing to see. They are so used to human visitors they accept you into their troop, letting you get as close as you like. Maybe they are just too lazy to object. Either way, it’s an intriguing experience; human-like behaviour mimicking a little piece of you. When you look into their eyes their is an intelligence and understanding you don’t see in other animals. This one was relaxing in the hot spring, bleary eyed and lazy as he peers over the edge at the enraptured photographers. He is probably wondering what is so interesting, us both as much a zoo attraction as each other. The monkey park is a photo haven, their willingness to pose and colourful faces making it difficult to take a bad one. I took lots and thought I would make a regular feature- ‘Monkey Moments’. 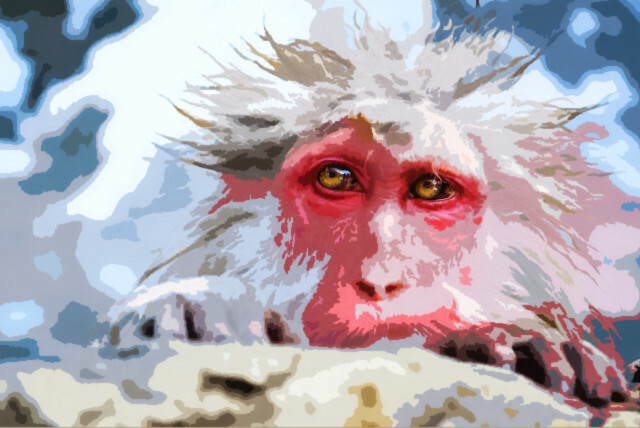 One monkey per blog post, until I run out of good ones. See some other monkey moments. WINNING PHOTO in the Photo Lord daily photography competition. See it here. RUNNER UP in The Telegraph ‘Big Picture’ Photography competition. See it on my blog here or on the Telegraph website here. FRESHLY PRESSED!… on the worpress.com homepage. See it here. WINNER! in The Times weekly travel photography competition. See it here. WINNER! in the picstop.co.uk animal photography competition. See it here. ALBUM COVER ART WORK – My spiky-haired friend has made it onto an album cover! In Situ, by Zindagi Band. See it here. this is an amazing shot, winegums! its look is so expressive, it looks so human!! great work! They look so human! The way they use their hands especially! Thanks! Loving your new 366 blog! That’s just brilliant. Great capture. Thanks! It was hard to take a bad one! What a wonderful spur of the moment shot! Seriously impressed, sir! Thanks! It was one of those things that it is hard to take a bad photo of! AMAZING! That’s a great photo. What a spectacular photo. Great shot. Brilliant…love the expression, pose, angle…he must have really listened to your direction 🙂 hehe…great shot! Thanks for liking my post and leading me to your blog, it’s fascinating. Saw a documentary about those macaques; how lucky you are to see them ‘live’. Looking forward to seeing more images. The expression on this one is ace! Thank you! I really appreciate it 🙂 I just had a look on your blog and its great. I love your wanderlust and your illustrations. Best of luck with your 365 journey! It is on my to do list to go and see these monkeys in the hot spas! Where is a good place to go?